Babblings of a Mommy: Row, Row, Row Your Boat. On Wednesday we ended going into the city to meet with the fam and spend some QT for the 4th of July. We ended up staying the majority of the time in Central Park, although at one point it was so hot I thought I was this close to passing out. Our solution was to get up and walk around so we can stop focusing on the heat. 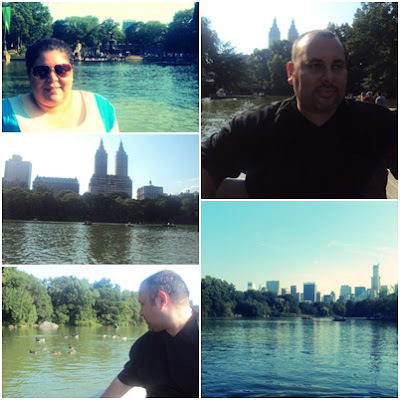 We ended up in front of the Central Park Boathouse, which we have passed many of times, but this time Jason felt like getting all Notebook on me and took me out on a row boat. I wasn't so sure I wanted to get on, to tell you the truth - but I'm glad I did. When we got there, it was close to sundown so we got to enjoy the amazing views, the nice breeze, some alone time with the hubbs, and what do you know - we actually ran into a group of ducks! Amazing you have such a great husband hope u had a great time.